Having covered the basic concepts behind the handling of iOS user interaction with an iPhone touch screen in the previous chapter, this chapter will work through a tutorial designed to highlight the handling of taps and touches. Topics covered in this chapter include the detection of single and multiple taps and touches, identifying whether a user single or double tapped the device display and extracting information about a touch or tap from the corresponding event object. The example application created in the course of this tutorial will consist of a view and some labels. The view object’s view controller will implement a number of the touch screen event methods outlined in An Overview of iOS 4 iPhone Multitouch, Taps and Gestures and update the status labels to reflect the detected activity. The application will, for example, report the number of fingers touching the screen, the number of taps performed and the most recent touch event that was triggered. In the next chapter, entitled Detecting iOS 4 iPhone Touch Screen Gesture Motions we will look more closely at detecting the motion of touches. Begin by launching the Xcode development environment and selecting the option to create a new project. Select the iOS Application View-based Application template and the iPhone product option and name the project touch. When the main Xcode project screen appears we are ready to start writing the code for our application. Having declared the outlets it is time to design the user interface. 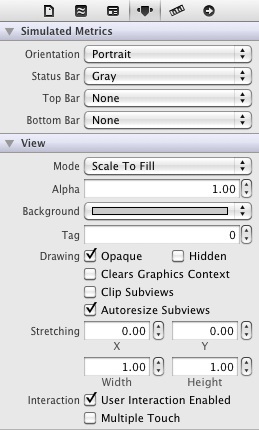 When adding the labels to the right of the view, be sure to stretch them so that they reach to the right hand margin of the view area. Ctrl-click on the File’s Owner icon and drag the resulting blue line to the label adjacent to the Method: label and select the methodStatus outlet from the resulting menu. Repeat these steps to establish connections between the touchStatus and tapStatus outlets and the corresponding label objects. This method obtains a count of the number of touch objects contained in the touches set (essentially the number of fingers touching the screen) and assigns it to a variable. 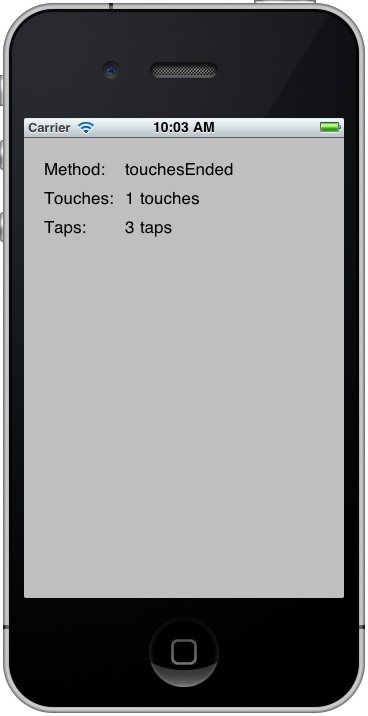 It then gets the tap count from one of the touch objects. 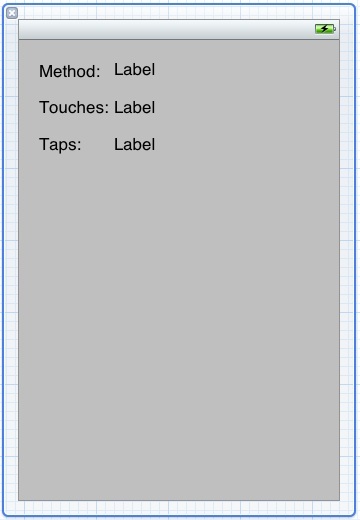 The code then updates the methodStatus label to indicate that the touchesBegan method has been triggered, constructs a string indicating the number of touches and taps detected and displays the information on the touchStatus and tapStatus labels. Once again we report the number of touches and taps detected and indicate to the user that this time the touchesMoved method is being triggered. Of course, since a mouse only has one pointer it is not possible to trigger multiple touch events using the iOS Simulator environment. In fact, the only way to try out multitouch behavior in this application is to run it on a physical iPhone or iPod Touch device. For steps on how to achieve this, refer to the chapter entitled Testing iOS 4 Apps on the iPhone – Developer Certificates and Provisioning Profiles.